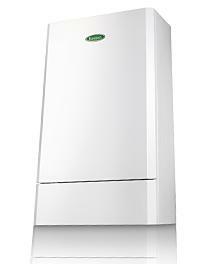 The Heat 45kW by Keston is a regular gas boiler that is wall mounted. This boiler is available as a 45kw or a 55kw boiler. This boiler has a lightweight design, helping to allow the boiler to be installed either on a wall or into a prefabricated floor mounted frame (including a back to back option). This boiler has an 89.2% efficiency rating making it B rated. The heat 45kW comes with a inbuilt weather compensator and inbuilt pump. This boiler comes with a minimum pressure of 0.3 bar and a twin flue of up to 21m. This boiler has a small installation footprint as well as a low NOx and a 50mm MuPVC solvent allowing it to be cost effective. With it being such a lightweight boiler this also allows for a cost effective installation. The heat 45kW boiler comes with a commercial control system as standard. This boiler is also available with five years warranty, allowing for a reliable boiler to suit your needs.